I received a very treasured gift this weekend from some truly lovely people! I have waited patiently for this book as it has been out of print or on back order in many bookshops across Australia and as soon as you turn the pages you can see why! 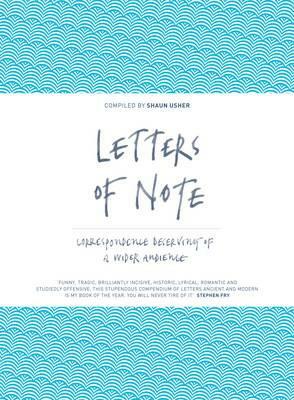 Where else is there a collection of letters from the famous, infamous and the ordinary throughout history. Letters such as Virginia Woolf’s heart-breaking suicide letter, to Queen Elizabeth II’s recipe for drop scones sent to President Eisenhower; from the first recorded use of the expression ‘OMG’ in a letter to Winston Churchill, to Gandhi’s appeal for calm to Hitler; and from Iggy Pop’s beautiful letter of advice to a troubled young fan, to Leonardo da Vinci’s remarkable job application letter, Letters of Note is a celebration of the power of written correspondence which captures the humour, seriousness, sadness and brilliance that make up all of our lives. I love this book but it also makes me a little sad. Gone is the day of the letter and with it a little magic. I don’t see there being ‘Tweets of Note’ or ‘Facebook Posts of Note’ and if there were, I don’t think I would be buying it…. « Happy 45th Birthday to The Very Hungry Caterpillar!